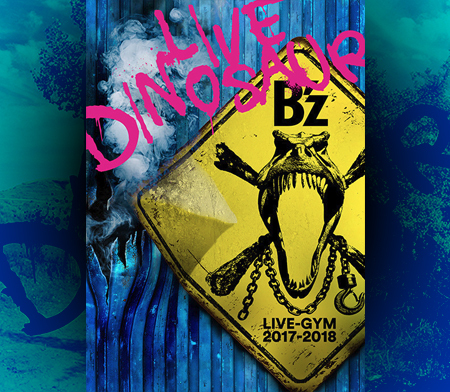 After their North American tours in 2002 and 2003, for the first time in 8 years, B’z is doing a North American tour called “B’z LIVE-GYM 2011 -long time no see-“, which will kick off on July 20th in Vancouver. “It’s been a long time since we toured in North America, I’m really looking forward to it. 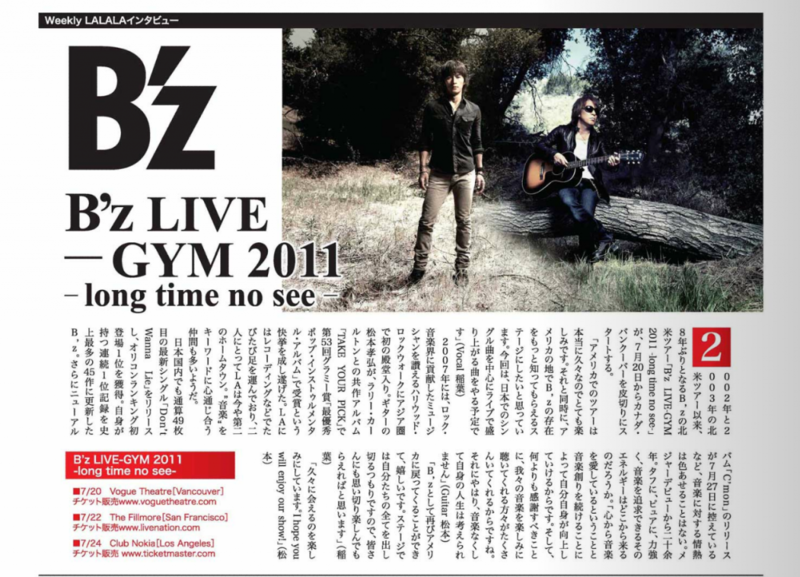 At the same time, I want to set the stage so that more people get to know B’z in North America. This time we’re going to focus on our Japanese songs that have been released as a single and play songs that will be rocking the house.”, says vocalist Koshi Inaba. In 2007, B’z was the first asian artist to be inducted into the Hollywood Rockwalk. Guitarist Takahiro Matsumoto won the Grammy for “Best Pop Instrumental Album” with his album “TAKE YOUR PICK” which he recorded together with Larry Carlton. Since both of them are regularly in LA to do recording and other things, for them, Los Angeles has become their second hometown. It also looks like they have a lot of friends there who interpret the keyword “music” the same way. With releasing their 49th single “Don’t Wanna Lie”, they’ve immediately topped the Oricon chart, raising the bar once again. 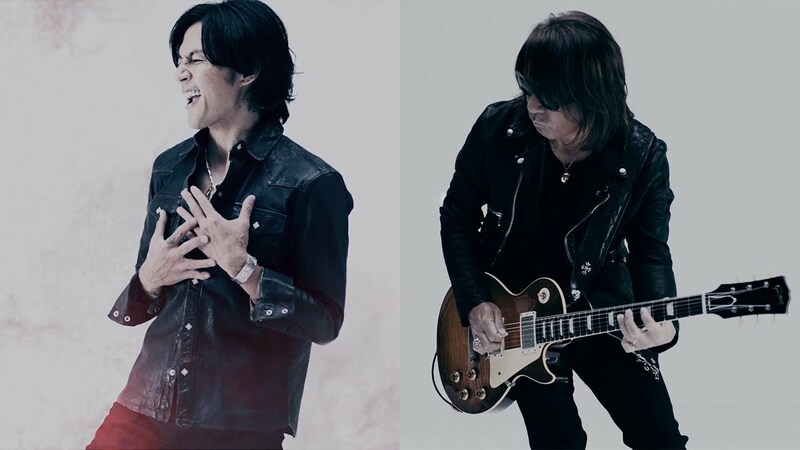 B’z, who updated their record of series of no.1 singles to 45 and is going to release their new album “C’mon” on July 27th, doesn’t show a sign that their passion for music is fading. It has already been more than 20 years since their major debut. Where does that energy come from, that enables them to continue producing music? “It’s because I love music from the bottom of my heart and when it comes to producing music, because I can always improve myself. More importantly, though, because there are so many people that enjoy our music. Also, I can’t imagine a life without music.”, answers guitarist Tak Matsumoto. 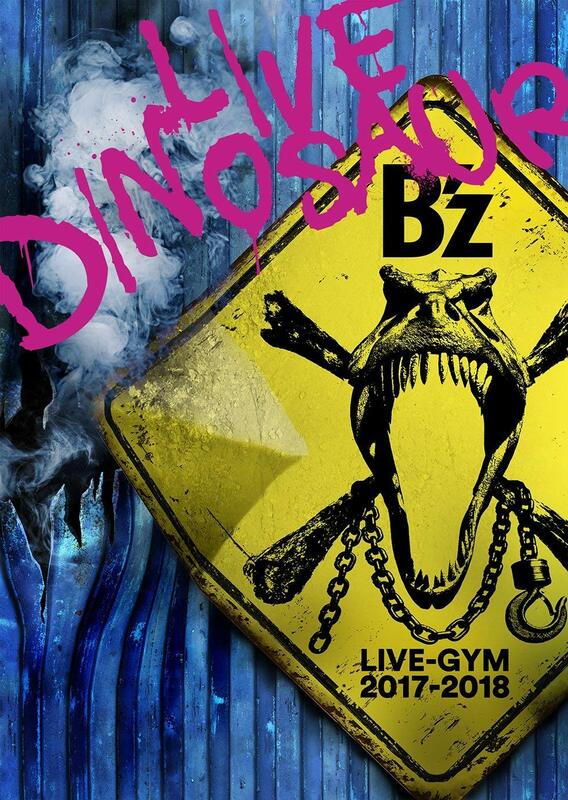 So… is B’z looking to push into the (North) American market? What do you think? NBW: Mr. Matsumoto, you were awarded a Grammy and the band became the first Asian musicians to be inducted into Hollywood’s Rockwalk of Fame. What’s next? TM: It’s been 8 years since we last played in the U.S. We would like to keep on playing all over the world from now on. KI: We would like to do more shows and introduce our music to the people in the U.S. The Vancouver Shinpo, a Japanese newspaper located in Vancouver(Canada), features an interview with Shane Gaalaas in its issue dated June 23rd. 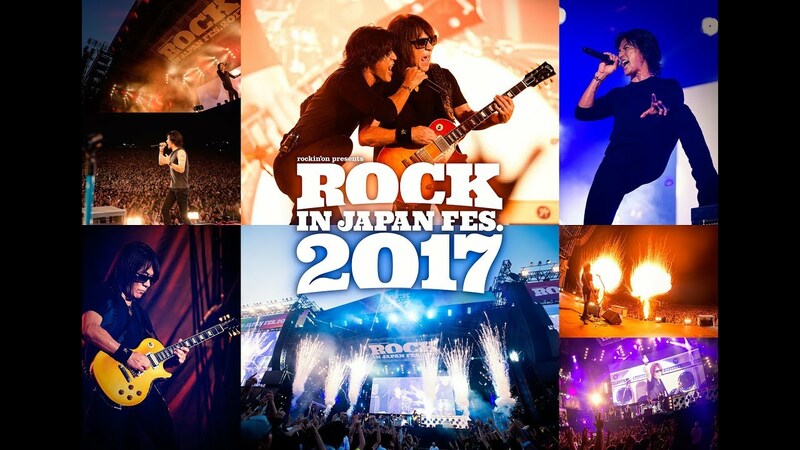 It looks like B’z management are really focusing on Japanese fans in general, seeing how the interview was published in a Japanese newspaper… in Japanese. Odon of B’z no bise as well as myself have requested Shane Gaalaas for an interview, but he never got back to us with an answer from B’z management. In the interview, he’s talking about the upcoming North American tour as well as his connection to Canada and Japan. I apologize for any translation mistakes I might have made. I haven’t met such humble people before. I think their CD sales, ingenuity and skills show pretty much how much work they’re putting into their music. But still, they’re keeping the balance between being humble and being proud. And it deeply impressed me that they’re not egocentric at all, they’re working as a team. Matsumoto-san and Inaba-san are like the Sedin brothers (Star players for the Vancouver Canucks). They’re supporting each other to become better at what they do. The set list is a secret, but I think everybody who’s coming to see the show will enjoy it. There are a lot of great songs, so it’s difficult for me to choose my favorite one, but I’ll enjoy performing every single song. As a drummer, I’m challenged with playing a lot of different styles. From funky to jazzy. To create good B’z CDs. As a drummer, I want to continually improve my skills. If I have some free time, I’d like to compose some solo songs, too. And I’d like to get better at surfing and ice hockey as well. What do you think are the charm points of Japan and Canada? I love spending time in Japan. I especially like Japan’s culture, food and people. There’s a lot of wonderful places in Japan, and every time I’m there, there’s always a new place for me to discover. I also like Canada’s culture. It’s pure. The people are relaxed and I think they enjoy their life without being too materialistic. You can really feel it when you’re there. And it’s especially a great place in summer. You’re originally from Innisfail, Alberta. What kind of place is it? I was born in Edison, Alberta and raised in Innisfail. Innisfail is a small, traditional and idyllic community. It’s about an hour drive from Calgary. The place has grown a lot. When I was a kid, about 2500 people were living there, but now, about 7000 people live in the city. It was a great place for me to grow up in. The winters have always been hard and long, but we made the best of it and had fun at playing ice hockey and skiing. And when I was 10 years old, making music became my dream. Since there aren’t that many opportunities in such a small place compared to big cities, I had to jam with my band members in my personal time. Most of my family still lives in Innisfail, so I’m trying to see them about twice a year. Are you looking forward to the North American tour? Yeah, I’m really looking forward to it. My friends and family plan to come to the performance in Vancouver. Before I started living in Los Angeles, I used to live in Vancouver for two and a half years. I remember I was very surprised how open Vancouver’s society is. There are a lot of delicious restaurants and I got to meet a lot of wonderful people. I think Canadians are the most friendly people in the world. If I have some time during the tour, I’d love to show my friends the great places in Vancouver. Of course!! I’m Canadian, after all!! I probably started playing ice hockey at the same time. Even now, I sometimes go to the skating rink near my house and play hockey. I support the Calgary Flames as well as the Vancouver Canucks. When you showed me your CV, I admired all the things you’ve achieved in your life. Your skills and passion are a given, but what makes you different from other people? Thank you. I’m thankful that I can lead my life as a musician. I’m not exactly sure how that makes me different from other people, but I think I’ve always had the strength to set new goals and pursue them until I’ve achieved what I wanted. I wanted to do music. I think when people manage to put their energy and passion into something, they’ll be able to achieve what they desire. This might be a common way of saying it, but whatever difficulties you might experience, you should always pursue the things you like doing. There might be a lot of difficulties, but you should turn these hurdles into good experiences. And you should have fun at doing that. There have been quite a lot of good news the past days. An Account called PEPSINEX_LIVE has been spotted on UStream and it looks like they’re testing the equipment for streaming the show right now. 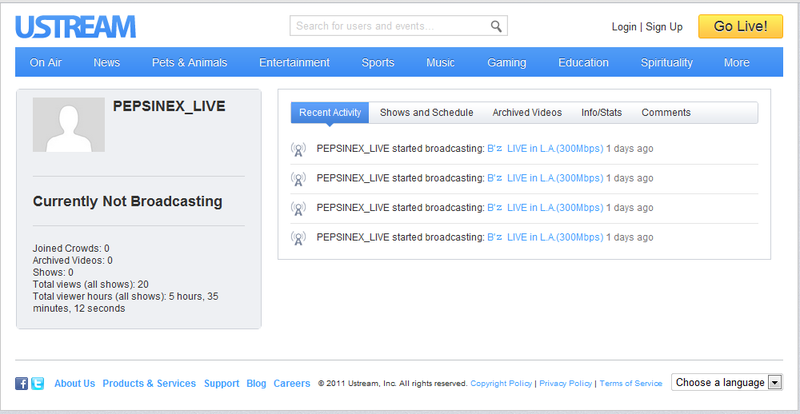 On the channel page it says ” PEPSINEX_LIVE started broadcasting: B’z LIVE in L.A.(300Mbps) 1 days ago”. 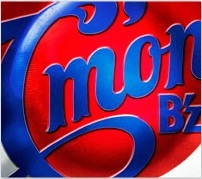 And since the account is called Pepsi NEX… they might also stream the PEPSI NEX special performance on September 28th. Who knows? We expect official news in the next days. Stay tuned! Linkin Park is inviting B’z to perform with them at their special secret concert. All you have to do is create a page at http://www.give2gether.com/projects/music-for-relief/, raise $500 for Japan with your page and get 2 tickets to the secret concert on August 31st! The full version of C’mon is now broadcasted by radio stations across Japan. C’mon proves to be a good song, but it’s far from hard-rock as you’d imagine. It’s a song for a commercial after all. 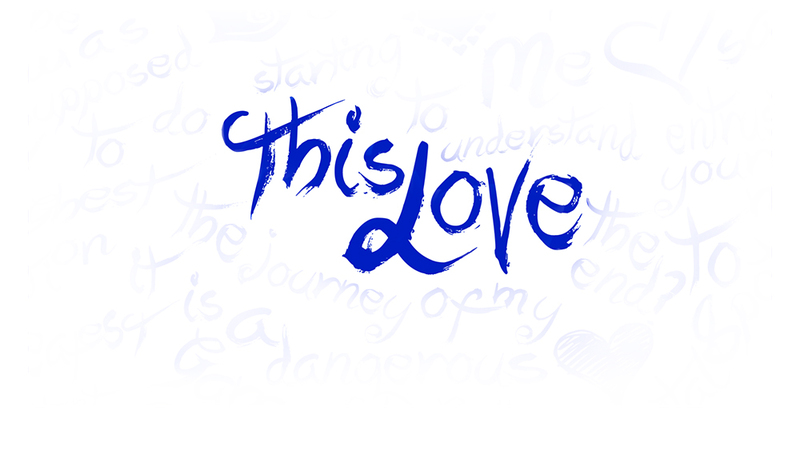 It does convince me with its bright melody and brilliant guitar solo (Tak :D). Look forward to listening to it!! “Don’t Wanna Lie” At No.1 & Special Campaign Announced! B’z new single “Don’t Wanna Lie” officially goes on sale today and directly enters the Oricon Daily Single Charts at #1 with having sold 54,248 copies on its day before official release. Sayonara Kizu Darake no Hibi yo, on the other hand, only sold 50,335 copies on its first day in stores. Pop idol group AKB48’s sales have dropped to 21,178 taking 3rd place in the charts. 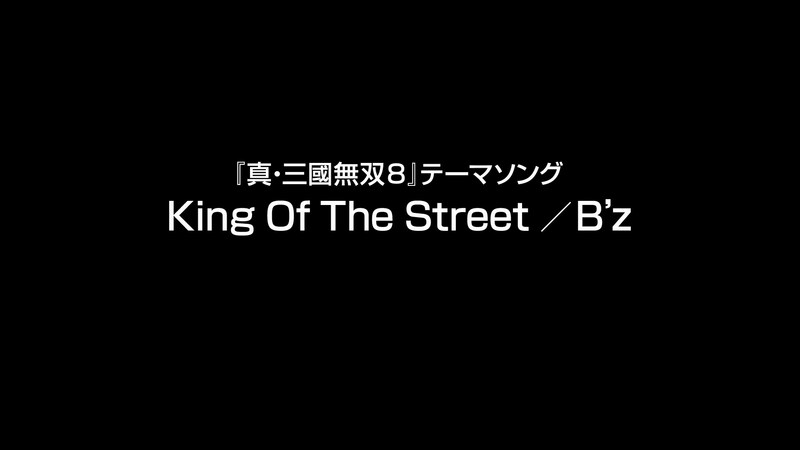 We’ll see if B’z will be able to enter the Weekly Single Charts at the pole position next wednesday. Especially, now that they’ve announced a new special campaign today (see below). Everyone, listen up! When you get your new single, read this first, before you throw away the seal that comes with the CD. 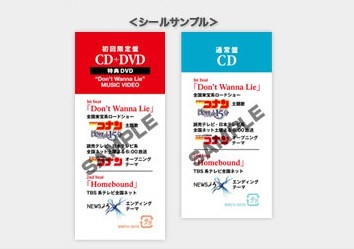 Because of this, a lot of B’z fans in Japan are now rushing into stores to get their copy of Don’t Wanna Lie and get a shot at getting one of those precious flags and/or the special CD. 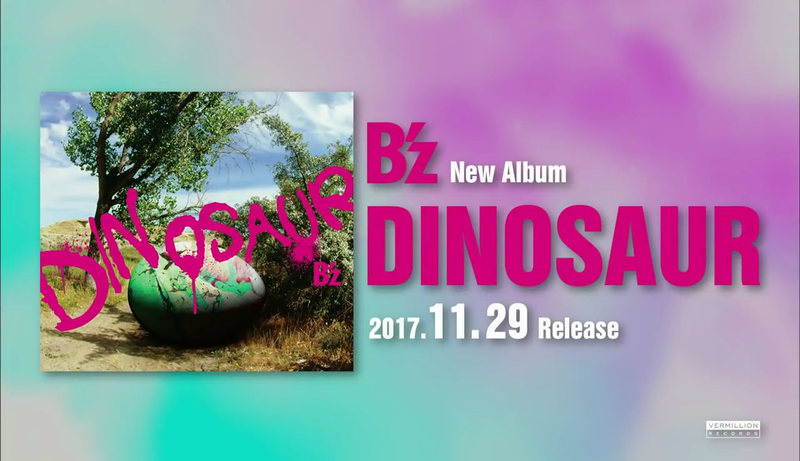 This will definitely strengthen B’z sales. Was this simply a marketing move to fight off AKB48’s sales? We’ll never know. You’re probably thinking “Damn, I won’t make it until June 5th!!”. That’s right, I won’t make it either, but, send it in anyway! Perhaps they’ll make an exception since it’s from overseas.